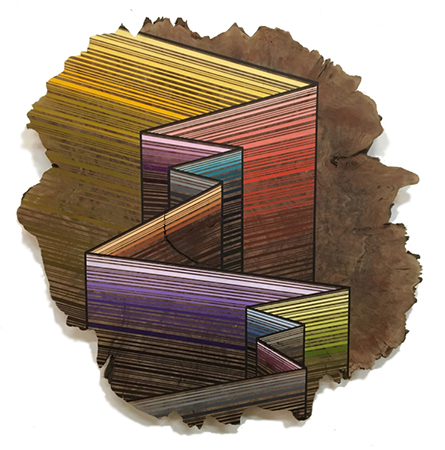 Jason Middlebrook, Strata walls #2, 2015. Acrylic on walnut, 27 x 26 x 1 inches. Courtesy of the artist and Jane Lombard Gallery. Rachel Beach‘s sculptures distinctly echo the concrete verticals and horizontals of the gallery space itself, but their strictness of form is countered by a sense of mischievous joy via their painted surfaces. Beach’s rigorous approach to painting revels in textures and colors that manifest pure playfulness and spirit, even creating trompe l’oeil moments that are directly in dialogue with the wood materials she builds with. Kira Nam Greene‘s work is deeply personal, with an intensive process of layering collaged images of food and intricate patterns which represent the plurality and multiplicity of her own Asian American female identity. She works between abstraction and figuration, using layers of gouache, watercolor, and pencil to create work that is at once loose and playful, yet scrupulously detailed. Cey Adams, a New York City native, emerged from the downtown graffiti movement to exhibit alongside fellow artists Jean-Michel Basquiat and Keith Haring. He appeared in the historic 1982 PBS documentary Style Wars, which tracks subway graffiti in New York. As the Creative Director of Def Jam Recordings, he created visual identities, album covers, logos, and advertising campaigns for Run DMC, Beastie Boys, LL Cool J, Public Enemy, Notorious B.I.G., Maroon 5, and Jay-Z. Adams’ own practice involves dismantling various imagery and paper elements to build multiple layers of color, texture, shadow, and light. He draws inspiration from ’60′s pop art, sign painting, comic books, and popular culture, and focuses on themes including pop culture, race and gender relations, cultural and community issues.